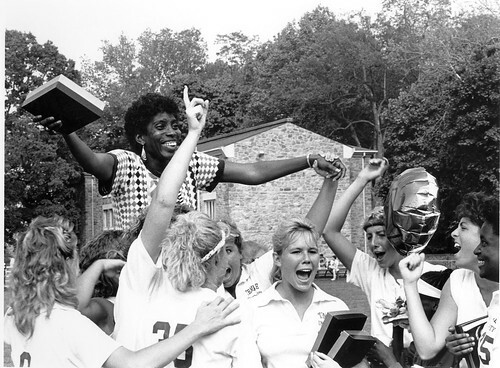 Twenty years ago, the women’s lacrosse team accomplished something that no Temple sport has since. They won a national championship. The title-winning team went 19-0 as an independent that season on their way to their second national championship. The Owls previously won the crown in 1984. The year before their 15-7 victory in the 1988 national championship game, the Owls watched their perfect season slip away with a 7-6 loss to the Penn State Nittany Lions in the finals. The next season, the team again took an undefeated record of 18-0 into the championship game. “Penn State was a thorn in our side,” said Barbara Questa, who is now St. Bonaventure’s senior associate athletics director. Cummings-Danson and Kim Ciarrocca, now the women’s lacrosse coach at the University of Delaware, were just two of six all-Americans from that 1988 Temple squad, which returned all but one player from the previous year’s starting lineup. O’Leary, who was also the Midfielder of the Year in 1988, Questa, Kelly Grimm and Denise Bourassa rounded out the other four. “Those players were a coaching dream,” former coach Tina Sloan Green said. Green, the first coach in Temple lacrosse history, roamed the sidelines for the Owls from 1975 to 1992. “They were tremendous leaders on and off the field and when they walked on the field that day [in 1988 against Penn State], they knew exactly what they needed to do,” she said. Cummings-Danson led the way in that game versus Penn State, scoring four goals, three of them in the nine-goal first half. She ended her senior year in 1988 by scoring a program-record 88 goals in a season and NCAA-best 289 goals in her career. To this day many of the former players still keep in touch, attending the National Lacrosse Hall of Fame inductions of Sloan Green, O’Leary, and Cummings-Danson in 1997, 2005, and 2007, respectively. And, of course, they all still wear those championship rings. The current Temple women’s lacrosse team continued its quest toward making the NCAA Tournament for the first time since 2004 by beating the visiting Villanova, 21-7, at Geasey Field Saturday. Senior attacker Nicole Caniglia and senior midfielders Whitney Richards and Berkley Summerlin scored 14 of the team’s 21 goals on their Senior Day. Of those 14, a career-high seven came from the hands of Summerlin. The Owls (11-4, 6-1 in the Atlantic Ten Conference) trailed only once in the game, when Villanova (4-11) scored the first goal two minutes and 39 seconds into the match. Temple then went on two separate runs of four and five goals, respectively, to take a 13-5 lead into halftime. After back-and-forth scoring early on in the second half, the Owls scored the final five goals of the game. Temple will host No. 2 Princeton (10-2, 4-0 on the road) Wednesday afternoon at 4 p.m.